and baptised at St. Nicholas Church, Ozerna. She at­ tended school at Frazer and Sandy Lake. In 1967, she received teacher training at Brandon College and later taught school at Birtle and Shoal Lake. On June 27, 1970, Joyce married Eugene Lepischak at St. Nicholas Church, Ozerna. They mix farm in the Rossburn, Manitoba area, and Joyce teaches part time at Rossburn. Joyce and Eugene have three children; Tristan was born January 1, 1975. Twins, Darla and Derek were born on November 12, 1977. Victor, born November 19, 1951, at the Erickson Medical Nursing Unit with Dr. Burke attending, and was baptised at the St. Nicholas Church, Ozerna. He attended school at Frazer and Erickson Collegiate and then worked in the Thompson Nickel Mines for a year. On February 24, 1973, Victor married Lana Shellborn at the Bethlehem Lutheran Church, Erickson. Lana, is the only daughter of Glen and Ada Shellborn. Victor helped with the Cubs and Scouts for a year and served a term on the Village Council. Lana was Superintendent, and also taught Sunday School at the Erickson Lutheran Church. Victor is employed at the Riding Mountain National Park and Lana helps her father at Shellborn Enterprises. Victor and Lana have two children: Tyler and Myranda, who are attending Erickson Elementary school. Tyler, born September 29, 1973, at Minnedosa Hospital. He attends the Bethlehem Lutheran Church Sunday school, a Jr. Choir member, a 4-H member and has taken Ukrainian dancing. Myranda, born June 22, 1977, at Minnedosa Hospital. She attends Sunday school at the Bethlehem Lutheran church, a Cherub Choir member takes piano lessons, and has also taken Ukrainian dancing. Shirley Ann, born November 16, 1954, at Minnedosa Hospital with Dr. Hinch attending and was baptised at the Sacred Heart Church, Erickson. She attended school at Frazer, Sandy Lake and Erickson Collegiate, and in 1973, received a Hairdressing certificate in Winnipeg. On October 12, 1974, Shirley married Terry Geletchuk at the St. Nicholas Church, Ozerna. Terry is son of Anna and the late Harry Geletchuk who had moved to the district from Saskatchewan. On May 18, 1977, their home on N. W. 32-18-18W was destroyed by fire, losing all their belongings. Shirley is presently a Cook at Southgate Manor Hotel, Onanole, and Terry is a Heavy Equipment operator with Parks Canada. They own the N 1/2 32-18- 18W. Christopher Allan, born February 27, 1962, at Min­ nedosa Hospital and was baptised at the Sacred Heart Church, Erickson. He attended school at Sandy Lake, Erickson, Roblin, and received an Electrical Course at Assiniboine College, Brandon. He is employed in Alberta where he resides. The quickest way to do many things is to do only one thing at a time. Eskil (1860-1945) was born in Rossund Jamtland, Sweden. Augusta (1872-1935) was born in Sweden. They had nine children, all born in Sweden. Charles (1894-1942) better known as Charlie, was the oldest son and was the first one of the family to come to Canada. He worked for Fred Ostrom, Victor Walstrom and Matt Olson's sawmill, and Hemmingson's sawmill and various other jobs. He liked working with steam engines and was fireman for Rognan's threshing outfit for about 17 years. He used to crush grain, saw wood and do butchering for different people in the area. In 1919, he married Esther Gunnarson (1892-1965). 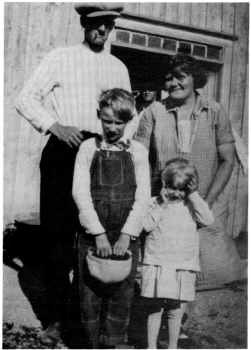 Charlie, Ester, Arnold, Lillian Backlund.